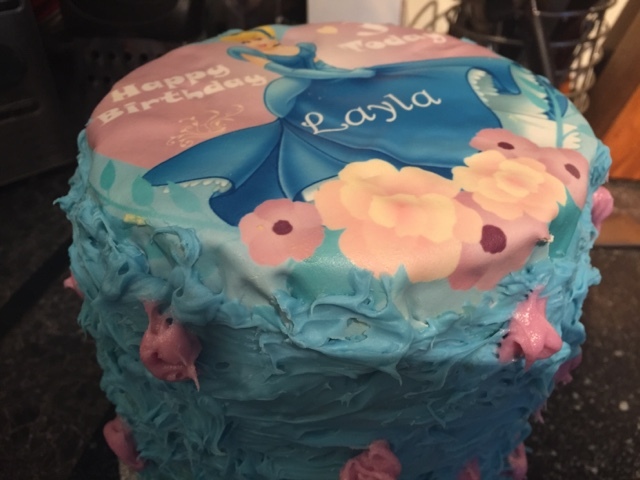 So my little monkey turned three a couple of days ago and her request for the day was everything to do with Cinderella. 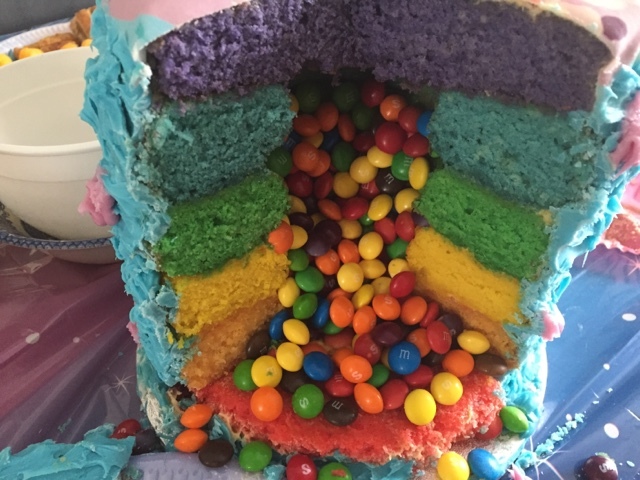 Trouble for me is that I am no professional cake maker so I wasn't sure how to translate this theme onto a birthday cake. Lucky for me I found some lovely personalised cake toppers on eBay so all that was left to do was actually make the cake. 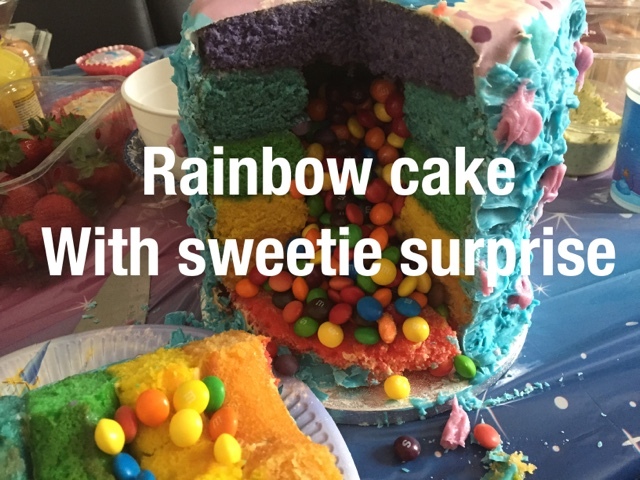 I set myself the hard task of making a rainbow cake. 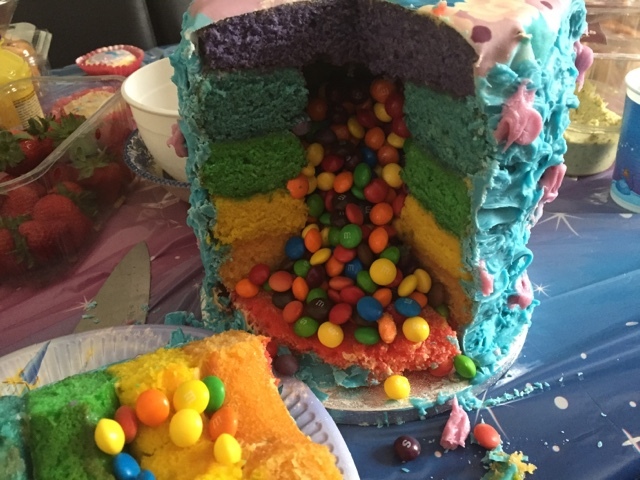 This wasn't going to be just any rainbow cake though, oh no, the girls and I decided that we'd like to have a rainbow surprise inside too consisting of lots and lots of Skittles and M&Ms mmmm. 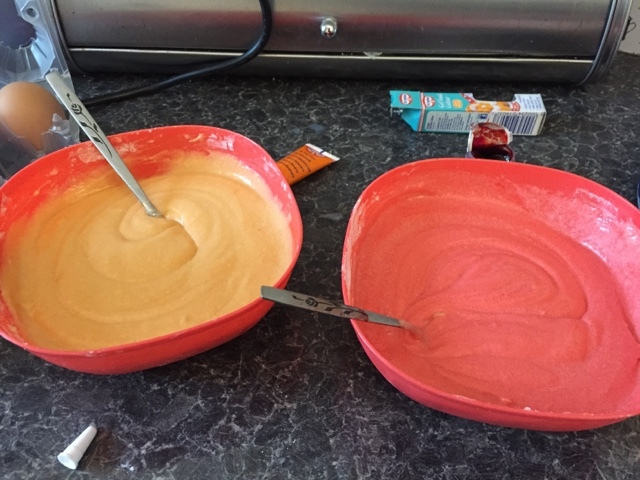 I multiplied the quantites by three and then divided the mixture into 6 bowls ready to create all the colours of the rainbow. Then it was time to add the colouring to each of the bowls. 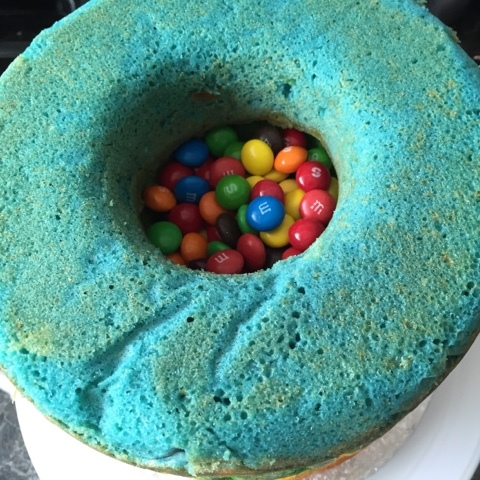 I really wanted bright colours but I couldn't be sure how they would turn out when baked. 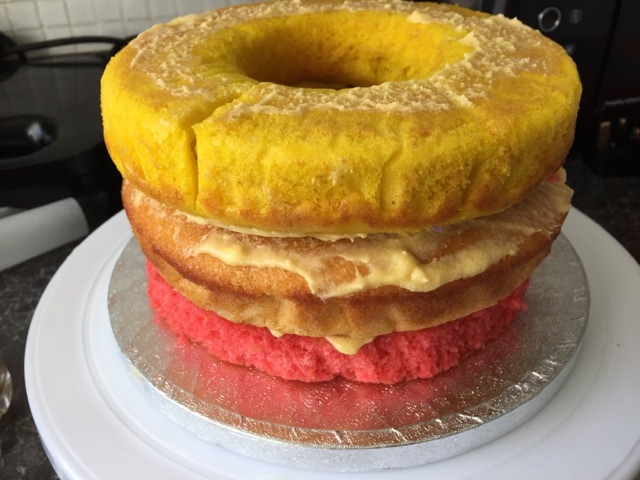 All cakes were baked for around 20 minutes however 4 of the 6 cakes were baked in a savarin cake tin to create the hole we needed in the middle. 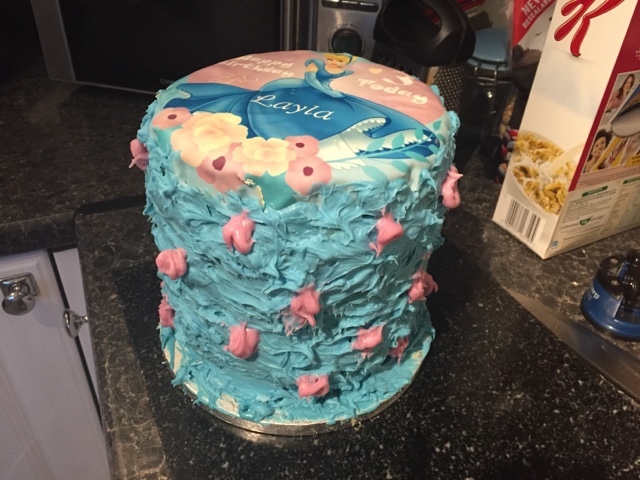 After leaving all of the cakes to cool I then had to stick each layer of cake together, to do this I used a simple butter icing. Then of course the sweets needed to be added. 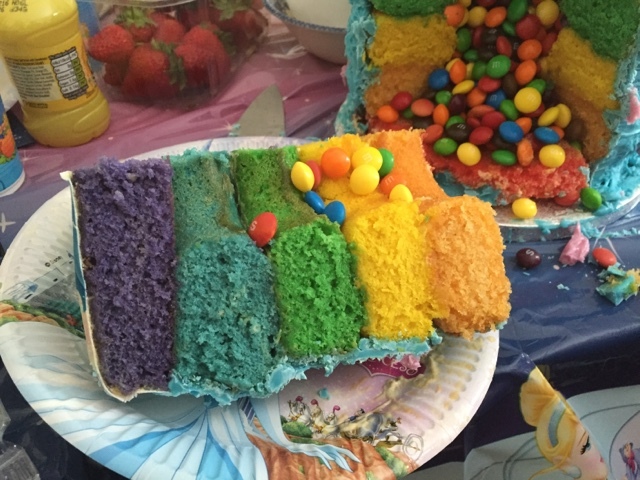 The next step was where I wasn't sure what to do, I became uncertain on just how to decorate the outside of the cake. I knew rolled out icing would work however whenever I've attempted in the past the icing seems to just fall apart. In the end I opted to cover the cake in candy melts and pink icing. Adding a crumb catching layer of butter cream first. Ok I know it isn't the neatest, I know I'm no professional but at least it stayed standing upright. And everyone was pleasantly surprised when we cut into the cake.